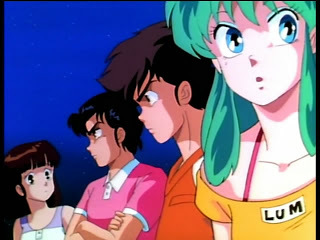 Shuutaro helicopters Ataru and Shinobu to a remote, tiny island that Lum has to find, where they Ryuunosuke fighting with her father, Fujinami-san, because he’s established a tea shop in a place where they can get no customers. 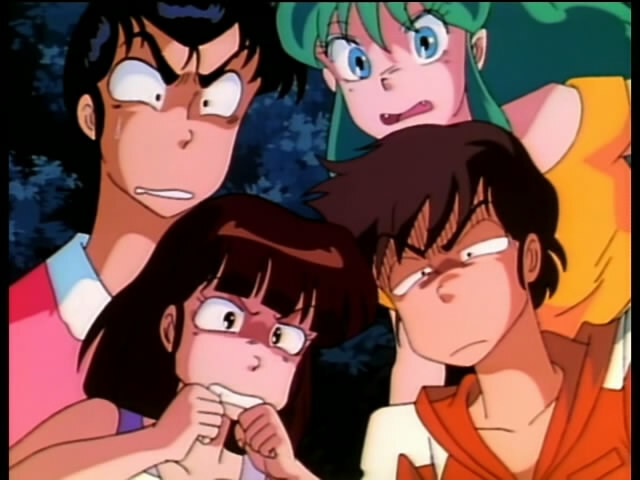 Ataru and company find it odd that Fujinami-san could afford to buy an island, which he says cost him ¥300, a price that they find insanely low, but which Ryuunosuke finds insanely high. Fujinami-san puts their guests up into the small, attic storeroom, where they soon discover paranormal activities going on. Meanwhile, as Ryuunosuke fumes in a small bath, she senses a presence behind her and sends a bath bucket in that direction, where it hits the ghostly image of a young lady before the lady disappears. Everyone gathers to ask Fujinami-san about this, so he states the girl must be Nagisa, the daughter of his deceased friend. The shaved ice machine activates, so the group checks it out where they see a Frankenstein monster and a female skeleton. Shinobu and company are prepared to fight when the monsters reveal themselves to be Nagisa and her father Shiowatari, playing a prank. Ryuunosuke finds out that her father and Nagisa’s father arranged for Ryuunosuke and Nagisa to be married, which Nagisa is still pleased about despite being dead. However, her beloved “Ryuunosuke-sama” isn’t down for this, causing Nagisa to cry. Shiowatari ends up explaining how he and his daughter died while trying to come up with a unique shaved ice flavor, using sea urchins, that would draw customers to the tiny, remote island. Fujinami wants to carry on the work and Nagisa longs to kiss her fiance. Fujinami gives his blessing, but Ryuunosuke refuses, causing Nagisa to flee, crying. Ryuunosuke chases her, trying to explain that she’s a woman, but Fujinami intervenes, forcing Ryuunosuke to punch him far away. 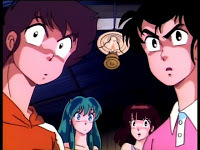 Ataru and the others stop Ryuunosuke from telling the truth and discuss the situation. However, if one kiss will allow Nagisa to depart to the afterlife, then deception is it. Meanwhile, Ryuunosuke tells Shiowatari that she is a woman, but he’s not concerned about that since Nagisa’s love for Ryuunosuke carried her through a lonely life. Ryuunosuke puts herself in Nagisa’s shoes and is touched by the story, enough so that Fujinami returns to knock Ryuunosuke out so that Nagisa can get her kiss. The moment I saw that this was going to be a Fujinami episode, I wanted to puke, except I was too tired from the massive hours of overtime I’ve been working of late to be bothered to get out of my chair, much less find the energy to actually go through the vomiting process. So, I stayed in my chair to watch, hoping this episode wouldn’t be utter crap. 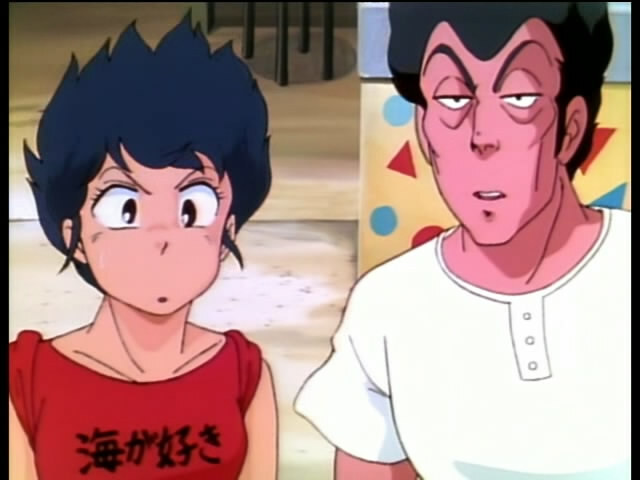 Fujinami and Shiowatari arranged for their children to be married when the kids were little. That’s the same as what Genma and Soun did in Ranma 1/2. Fujinami and Shiowatari have known each other for years and address each other with the “-kun” honorific. That’s the same as Genma and Soun. Shiowatari wears glasses and a bandana like Genma does. Shiowatari has a mustache and similar body structure to Soun. 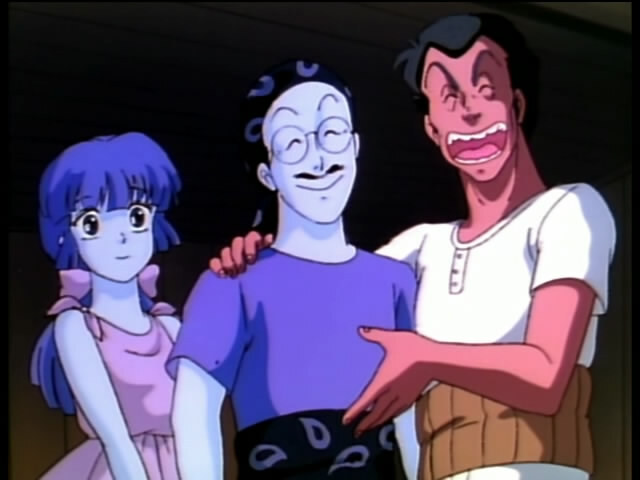 Ranma isn’t exactly human with the curse (turning into a girl when splashed with cold water), much as Nagisa is no longer exactly human, having previously died. The mothers are missing from the lives of Ryuunosuke and Nagisa, much as they were missing from the lives of Ranma and Akane. 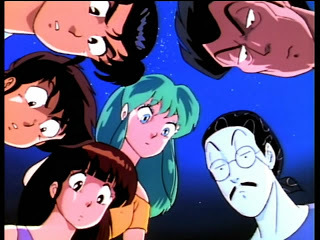 Considering that this story was near the end of Urusei Yatsura’s run, followed by Ranma 1/2‘s launch soon after, I don’t think it is much of a stretch to say that this is where Takahashi-sensei tested some of the Ranma 1/2 ideas. As to the twist in the story, I did find that funny, but only because of how Ataru and Shuutaro started questioning why they’d not been attracted to Nagisa. Otherwise, it is rather creepy, considering how jacked up Nagisa’s life is so that he behaves and dresses like a submissive, Japanese woman. The story also falls back to the usual Shinobu-Shuuaro-Lum-Ataru adventure mold, which was disappointing, especially since Shinobu and Inaba are a couple of sorts. Beyond that, the episode is a mixed bag for me. I can’t stand Fujinami, so that’s a massive negative. I did like the elements that would become Ranma 1/2, and on the whole, I was entertained with a good laugh at the end. So I’ll give this a marginal passing grade. I launched online Japanese Candy store called SakuraBox. There is a cool monthly Candy bag – please check us out! 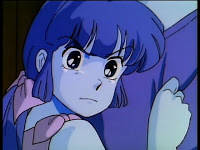 Another similarity is how Nagisa looks very similar to Ranma 1/2’s Akane at the beginning of the manga when she had longer hair. Inaba is still in the picture at this point in fact in the manga there are follow up stories for both Inaba and Nagisa (a three parter for Inaba and two chapters for Nagisa and they are published back-to-back). While the stories don’t definitively resolve the couplings they do strongly allude to the permanent pairings of Inaba/Shinobu (moreso in their case)and Ryuunosuke/Nagisa. There’s also one more chapter that comes right before the final story arc that deals with a magic hot spring that changes people into animals…and it’s the final Kitsune chapter. 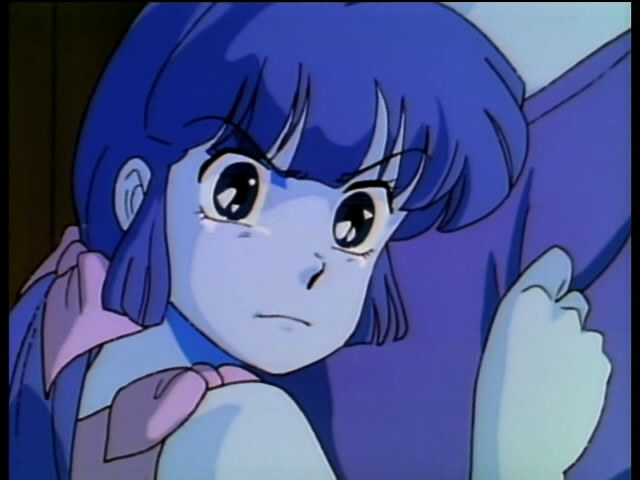 >Another similarity is how Nagisa looks very similar to Ranma 1/2’s Akane at the beginning of the manga when she had longer hair. I had completely forgotten that Akane had long hair at the start, but you are absolutely right. >There’s also one more chapter that comes right before the final story arc that deals with a magic hot spring that changes people into animals…and it’s the final Kitsune chapter. The final Ranma 1/2 element. Its been a while since I watched/read the Nagisa stories, but when I initially saw/read it, I was a little annoyed that Nagisa wasn’t treated that sympathetically once characters learned of his true gender, unlike with Ryuunosuke. Like with Ryuunosuke, she’s a tragic victim of her father, and given sympathy by the non perverted characters. But with Nagisa, once its revealed he’s a guy, its just “haha, transvestite!” Like even the reasonable characters like Sakura just view Nagisa as a simple freak. However, its been a long while since I read the stories involving Nagisa, so I could be remembering it wrong? With Ryuunosuke, the gag humor was turned on in favor of her being a reverse trap that Ataru could hit on.